As we all know India is a land of opportunity and if we look into the current surge in the Indian economy and specifically in the manufacturing sector there is a plethora of opportunity for growth and technological advancement. 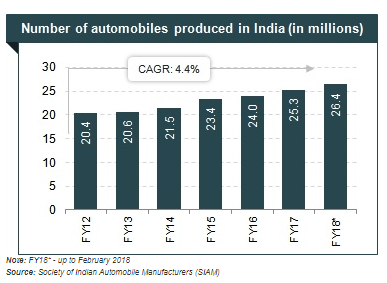 The Indian vehicle industry is one of the biggest around the globe. The business represents 7.1 % of the nation’s Gross Domestic Product (GDP). The Two Wheelers section with 80 % of the pie is the pioneer of the Indian Automobile showcase inferable from a developing white collar class and a youthful populace. In addition, the developing enthusiasm of the organizations in investigating the rustic markets additionally helped the development of the part. The general Passenger Vehicle (PV) fragment has 14 %. India is likewise a well-recognized auto exporter and has positive growth opportunities in the near future. General car trades grew 15.81 % year-on-year between April-February 2017-18. Also, some of the initiatives by the Government of India and the major auto OEMs in the Indian market are expected to make India a pioneer in the 2 wheeler and Four Wheeler (4W) around the world by 2020. The car business is set to witness radical changes as electric vehicles (EVs), shared mobility, and stringent emission norms. Talking about the new technology, the electric vehicle (EV) sales expanded exponentially in FY16-17 and are poised to rise further on the back of cheaper energy storage costs and the Government of India’s vision to see six million electric and hybrid vehicles in India by 2020. With the automotive sector currently going through a phase of serious transformation, led by the technology revolution in the area of manufacturing, and the future of mobility shifting away from conventional modes to sustainable solutions like electric mobility, there is a tectonic shift going to sweep the industry in the times to come. Accordingly, 50 to 55 percent of the Indian workforce in the auto segment is pegged to be sent in employments with drastically unique ranges of abilities by 2022. While it is sure that innovation is set to change the future, likewise uprooting individuals from their general occupation parts, it could possibly be the new chance to impart the desired aptitude to individuals in an unexpected way, in any case, not shying far from skilling, which remains the genuine goodness of development for one of the key drivers of the Indian economy and specifically the auto sector. Problem solving is an essential ability for engineering graduates to acquire. Be that as it may, in most customary engineering classrooms, students work on taking care of very much structured issues which isn’t adequate in light of the fact that specialists should have the capacity to take care of real world issues which are often not structured. In this way it is vital for engineering students to be prepared in unstructured problem solving through a structured approach. We at Shainin® believe that the technical problem solving can be classified into 3 types. Cause analysis through a brain storming approach leading to the desired effect. Discovering the root cause from the effect using a dictionary game. Now, if we were to think over these 3 processes in the current and the future context, we need to understand a scenario where the problems are new and with no previous record. What do we do then? Will we have enough technical knowhow to brainstorm? And will it be Lean enough? We at Shainin® specialize in the third way of problem solving using simple, ready to comprehend tools which can be used by anyone and everyone. In line with our motto “Solving critical technical problem – Around the world, around the clock” we are glad to announce the incorporation of our Indian arm – Shainin® India Services. Incorporated at Pune (also known as the “Detroit” of India) in the state of Maharashtra we are rearing to bring forth our tried and tested, world renowned technology, in the field of Problem solving and Training services. Being in Pune not only helps us to provide our clients immediate response to the huge auto-hub already present in the city but also quick access to all the major manufacturing companies across India. What we bring to the table is a dynamic shift in the way complex and technical root causes are discovered, which will certainly be a shot in the arm of Indian OEMs and component manufacturers. 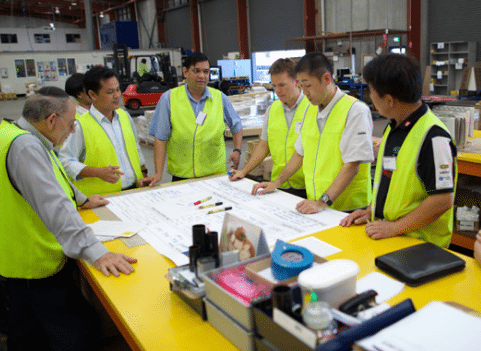 We offer our benchmark training services along with certifications for Apprentice, Journeymen and Red-X® Masters developing the desired skillset of Root cause analysis and problem solving. As an organization which is well known for its passion for problem solving it is an honour and opportunity for us to serve our Indian clients with our benchmark services similar to USA, Europe and China. Shainin LLC Copyright© 2018. Red X Holdings LLC, a Shainin Company. All rights reserved.